Gita Jayanti is observed on the 11th day of the Shukla Paksha (waxing phase of moon) of Margashirsha month as per traditional Hindu calendar. Gita Jayanti 2019 date is December 8. 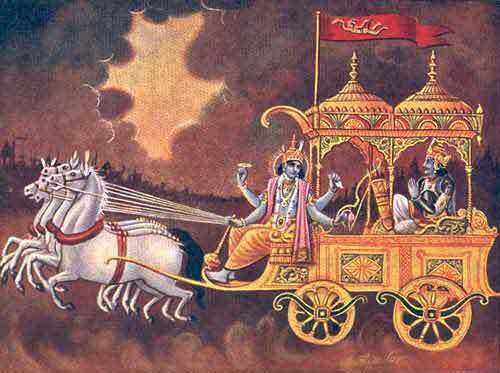 It is believed that the Bhagavad Gita was rendered by Lord Krishna to Arjuna on this day. Gita Jayanti falls on the Shukla Paksha Ekadashi day of the Margashirsha month (November – December). Bhagavad Gita adapts to the present and discusses an issue by rooting itself in the present. Everyday somewhere in the world a confused Arjuna seeks the advice of Krishna. Through the Bhagavad Gita, Lord Krishna has been discussing and debating various problems with individuals and finding solutions for thousand of years and will continue to do the same forever. What to do on Gita Jayanti or How is Bhagavad Gita Jayanti Observed? All Hindu temples, especially those dedicated to Bhagwan Vishnu and Sri Krishna, conduct special pujas on the day. Mokshada Ekadasi observed on the Gita Jayanti day and therefore many Hindu devotees fast on the day. In the famous Guruvayur Sree Krishna Temple in Kerala, Gita Jayanti is observed on a different day. It is observed on the Guruvayur Ekadashi day in the Malayalam month of Vrischikam (November – December). and he sees all beings in the Self! nor am I ever separated from him! The Bhagavad Gita is a piece of art of strange beauty and its stands apart from everything else, in a class all by itself. It is liquid poetry expounding solid philosophy. In the lucidity of its meter it crystallizes some of the rarest gems of moral and spiritual values. Its breezy discourses have a firm style. The fluidity of its eloquence falls like merciful rain upon every broken personality, making it whole by its magic touch. It is not a book of science, and yet, it is very scientific in its approach to the theme. It has not the airy nothingness of familiar philosophical discourses, and yet, all philosophies seem to meet within its ample stretch. But why a particular man should be called by this as a proper name may at first sight appear strange. Nevertheless herein lies a clue which enables us to understand not only the position of the Bhagavad Gita in the text and its connection with Arjuna and Krishna, but the entire current running through the whole of the Mahabharata, implying Vyasa’s real views of the origin, trials and destiny of man. Vyasa looked upon Arjuna as man, or rather the real monad in man; upon Krishna as the Logos or the spirit that comes to save man. To some it appears strange that this highly philosophical teaching should have been inserted in a place apparently utterly unfitted for it. The discourse is alleged to have taken place between Arjuna and Krishna just before the battle began to rage. But when once you begin to appreciate the Mahabharata, you will see this was the fittest place for the Bhagavad Gita. Historically the great battle was a struggle between two families. Philosophically it is the great battle, in which the human spirit has to fight against the lower passions in the physical body. Arjuna was about to engage in a war of extermination against foes that led by some of his nearest relations. We are each of us called upon to kill out all our passions and desires, not that they are all necessarily evil in themselves, but that their influence must be annihilated before we can establish on the higher planes. We should be so completely absorbed in work or study as to become unaware of everything else, even of its results. To achieve the best results from what we do, we should be focused on the action with undivided attention. Action should be done sincerely without worrying about its results. The results of the action will be greater if we put all attention and energy into the action itself and do not allow our energy to be diverted by thinking of results. The result will depend on energy put into action. We are asked not to worry about results during the course of action. The secret of living a meaningful life is to be very active, and do our best without thinking of our own selfish motives or even the results. A Self-realized person works for the good of all.